We've been listening to your feedback for more reporting and better insights into your data and are pleased to share a powerful new feature called multi-dimension reporting. 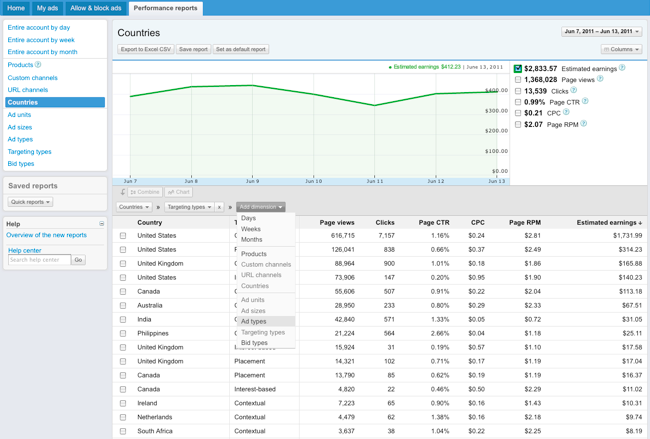 You can now add dimensions to your performance reports to sort and view data across multiple dimensions including ad units, ad sizes, and countries. This new feature allows you to add up to three dimensions to your reports, including viewing a channel by date or an ad unit by targeting type. To add a dimension when you create or edit a report, click ‘Add dimension’ and select a dimension. The dimension selected is added to the table, so you will now see two dimensions. To add another dimension click ‘Add dimension’ and select again. You can also change and remove a dimension by clicking the drop-down for the dimension you want to change or remove. Try multi-dimension reporting now to interactively explore your data and gain more performance insights. And stay tuned for more dimension combinations coming soon as we continue to improve reporting regularly. This reporting capability is just one of many improvements we’re making to the new AdSense interface as we gradually move away from the older version. Please feel free to provide your feedback in the comments field below so we can continue to tailor the new interface to your needs! If you haven’t yet tried the new interface, learn more about getting started today.